Remote Scheduler is a task scheduler application for Windows where user can manage tasks on one or more machines, ideal for those who need to manage multiple computers. Execute time scheduled tasks on multiple machine without required direct access to client. Update and execute tasks on all clients machine at once with few clicks. Define time and how often a task should be executed. Script base task, fully customize. Synchronize task trigger on multiple machines. No restriction on number of client machines. Password protected to prevent scheduler being shut down by unauthorized user. Managing different computers in a busy environment can prove challenging. What about a method to handle tasks from one central computer? Since I am always in such situations where I need to execute certain tasks on other computers, I have looking for a program that would help me do so remotely. During my search, I came across Remote Scheduler PREMIUM, which eased my work even more. Here is my experience while using the program. Given the program’s negligible size, the download and installation process took less than a minute. On launch, Remote Scheduler PREMIUM presented a very simple interface that was more of functional than aesthetic. The main options are at the top bar but I was quick to check out the User Manual under the Help option. After I was done with the User Manual, using Remote Scheduler PREMIUM was pretty easy. 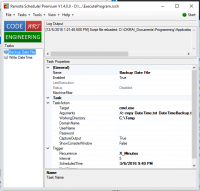 While using the program, most of my time was spent on creating and scheduling tasks. This option allowed me to select the target machine, the working directory as well as the user name and password. To execute the tasks on other machines, the domain name field came in handy. For a program that takes advantage of the execution level of the operating system, one would expect its heavy dependence on the processing power or memory usage. However, that was not the case with Remote Scheduler PREMIUM. As I was creating and scheduling my tasks, the program was smooth as Adobe After Effects was still running in the background. Even after I had already set my tasks, the program allows for later modifications. Updating existing tasks was only a few clicks away. At the same time, I was also able to update the time when my tasks were to be executed. In so doing, Remote Scheduler PREMIUM made it straightforward for me to use it especially with the need to synchronize the tasks across different machines. For anyone who does not really understand the concept behind scripting, using Remote Scheduler PREMIUM may prove challenging at the start. However, the available manual will try to ease things up a little bit. As such, it is clear that despite boosting of a simple interface, one would take time to find a way through the options and how to use them. 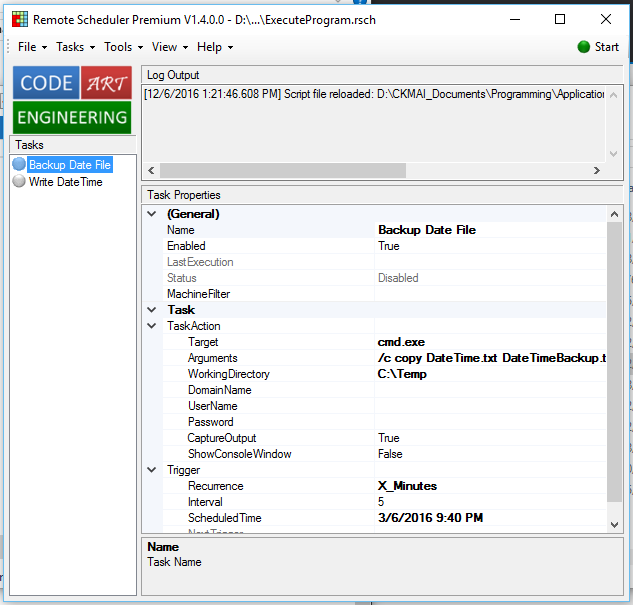 You would find a good companion in Remote Scheduler PREMIUM if you do manage different machines. The program will allow you to schedule and execute tasks remotely in few steps. Further, the program works smoothly hence you will not experience lags along the way. You can try it out to experience its worth. If you’ve ever found yourself responsible for multiple computers, you will know how hard it is to run from one machine to another to perform mundane tasks. Remote Scheduler seeks to make the job easier by letting you create one common schedules file, save it to a common folder and let the apps on different computers access this file and do the necessary tasks at the right time without having you lift a finger. This sounds like magic on paper. The question is: how does it perform in real life. To test it, I installed it on three computers and the common access folder used to share the configuration file was Dropbox. The fact that it works like a charm is itself a plus. Here is what I think of Remote Scheduler. Controlling multiple PCs made me think of cumbersome network configurations and the like. This was never the case. Configuring my PCs to all access a shared folder in Dropbox, setting all the other computers on client mode and creating the scrip from the master was all that I needed to do. Setting Remote Scheduler to client mode requests you to navigate to the schedule file and load it. This means that you can control computers over the internet or a local network as long as you are saving that file in any sort of shared folder. The GUI script creation wizard takes away or the complexities of Windows scripting meaning that you don’t really have to be a pro to create your scripts. You will have to choose the different parameters you want and state when the script should launch. At a specific time, or when a certain trigger kicks. You however have to be conversant with file and app .exe paths to do something sensible with Remote Scheduler. The whole idea of executing commands to multiple machines gets even better with the freedom to dictate which machine will handle what set of commands. This means that Remote Scheduler won’t change the computers under your control into one mindless zombie but into multiple powerful bots that are part of a bigger scheme. The client mode is all you need to read instruction and the scheduler app can be password protected to prevent unauthorized users in on the target machine from overriding it. Cross OS compatibility would be a great thing. Think of it this way. A good number of system admins (I included) create an impregnable wall by using a Linux or Unix distro. Better still, you could have computers under your control that run different OS. It would have been great if Remote Scheduler could translate the created script to cater for different OS machines at a go. Remote Scheduler works like a charm. It will give you absolute automation over remote PC. And by remote, I mean really remote since it’s operation isn’t limited to an intranet. Couple this with the easy configuration and you get the ultimate remote control that will make your management work a whole lot simpler.